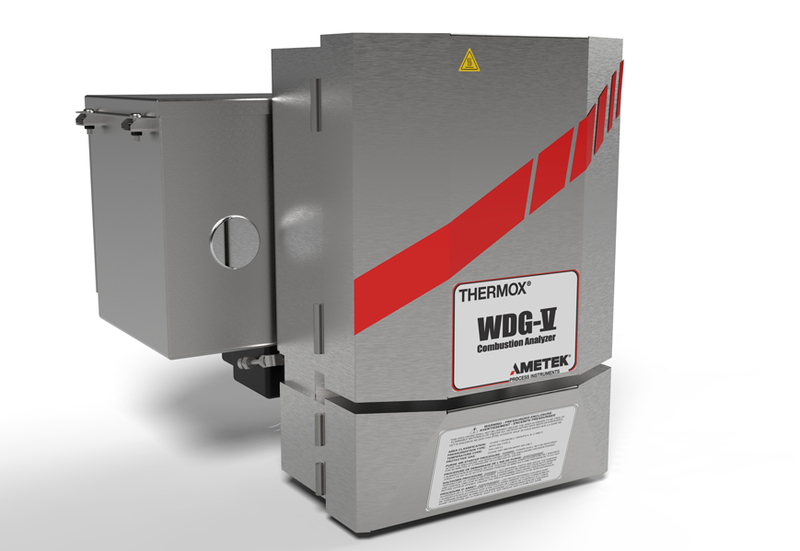 PITTSBURGH, PA – AMETEK Process Instruments has broadened its line of WDG-V series flue gas analyzers to include a Blowback option for high particulate applications. The WDG-V Blowback, leveraging industry proven zirconium oxide (ZrO2), provides efficient blowback cleaning of the sample probe and filter from an integrated, direct-mounted enclosure. The WDG-V Blowback is ideal for combustion optimization in power and steam boilers (coal, wood waste and heavy oil fired) and is the analyzer of choice for particulate loadings of up to 30 g/m³. With an integrated sample system, the WDG-V Blowback analyzer is simple and easy to use. By using an existing AMEVision HMI, operators can automate the blowback or perform it manually on the spot. An integrated flow measurement allows for blowback automation on a timed basis (e.g., once per hour), at a low flow threshold (e.g., 40% flow) or both. Users can also track or hold analog readings during the blowback period, as needed. The integrated enclosure means that the analyzer can be direct-mounted within a smaller footprint. It also eliminates the need for heated sample lines, minimizing installation time and simplifying air and power lines to single connections. To further reduce maintenance time, the enclosure is designed to allow users to service both the sample probe and filter without removing the analyzer from the process flange. Finally, the WDG-V Blowback is designed for reliability and safety. In addition to the predictive diagnostics and proactive alarms of the WDG-V series analyzer, the blowback option includes a heated accumulator to preheat the air and prevent condensation within the sample line during blowback. The system shares a self-regulated heater to maintain temperatures within the enclosure and to proactively signal low temperature via a contact alarm output. With its unique engineered design and automation, the WDG-V Blowback brings safety, reliability and serviceability to the forefront of combustion control in high particulate applications. AMETEK Process Instruments—the leader in online analytical instrumentation with the industry’s most extensive product line—offers analyzers based upon eleven differentiated technology platforms and used by markets ranging from oil, gas, and power to pharmaceutical and semiconductor chip manufacturing. AMETEK Process Instruments is a unit of AMETEK, Inc., a leading global manufacturer of electronic instruments and electromechanical devices. AMETEK Process Instruments joins AMETEK’s Chandler Engineering, Grabner Instruments, Petrolab and Spectro Scientific within the AMETEK Energy & Process Instrumentation (E&PI) division.